Sales Tax Registration is critical to the profitability of your e-commerce business in 2019 and beyond. Since the June 2018 U.S. Supreme Court Case, Wayfair vs South Dakota, the game has changed for nexus standards. Now, you have more than just physical presence to be concerned about. You must be on top of the economic nexus, notice and reporting states, and the marketplace facilitator states. As you know, with another year, there are more states that require you to register for sales tax permits in order to collect and remit sales tax, including “marketplace facilitator states”. This is extremely important as you must protect the 10% of your profits in the states where you have nexus. The number of states has grown since the Wayfair vs South Dakota U.S. Supreme Court Case in June of 2018. Over the years, we have applied for thousands of sales tax permits. The time-consuming steps in the process make it a pain to individually deal with most states. However, there is great news! We have perfected the 10 step process to help you get registered for sales/use tax. When you go to register to collect and remit sales tax, there are several mistakes to avoid in the registration process. Fortunately, our previous post outlines some of the costly sales tax permit registration mistakes to avoid. Past sales tax is still due. Washington clearly states that if you had sales prior to January 1st, 2018, you will owe that sales tax, plus penalties and interest. Economic nexus states. There are several FBA states that are also economic nexus states; if you are already registered to collect and remit, you are fine. There are a few economic nexus states that are NOT FBA states, so those are the states you have to monitor to determine if you pass the sales threshold, which is around a minimum of $100K or 200 transactions in sales. You may not be close to $100K in one state in one year of sales, but you very likely will be above the 200 transactions in sales to another state in a year. This results in registering to collect and remit in more states beyond just the FBA states. Washington is the first state to drop the transactions to determine economic nexus, a trend we expect to continue with new econominic nexus states that are added before the end of the year. Reporting States. There are some states that require you to either report all your sales to every customer in the state, so they pay the use tax, or you can register for a permit to collect and remit. Unfortunately, the fines are very high if you meet the threshold and don’t report your sales. The best approach, as you reach the state threshold of sales, is to register for a permit and collect and remit. Moving forward, here is what you need to know as you sell on Amazon.com FBA or other marketplaces with our summary of states where you may need permits. 29 FBA States (3 without sales tax -Delaware, New Hampshire, and Oregon). More FBA states are coming soon including Alabama and Missouri. 11 Reporting States, including 1 Reporting State (Non-FBA, Non-Economic Nexus) Oklahoma. 8 Marketplace Facilitator States (where Amazon is collecting the sales tax), registration is still required. Need Help with Your Sales Tax Registrations? Did your stock more to more FBA States? Have you passed the Economic Threshold in any states? Have you passed the sales levels in a state where you need to register for a permit vs comply with the reporting requirements? Keep in mind, this is a very busy time of the year for permits, and the states are a little slower to respond with the increased volume. We have two options one for members of Sales Tax System, and one for non-members. To learn more click here to go to our web page that covers our sales tax registration services. 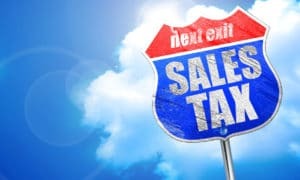 Avoid Costly Sales Tax Mistakes! Enter your name and email to receive a link to the "7 Costly Amazon FBA Sales Tax Mistakes Most Ecommerce Business Make" special Report and video overview.